I have been privileged to be on the beta team for this app for a little while now and it is stellar. I have covered it’s desktop counterpart in the past but having it now on the iPad is especially useful. 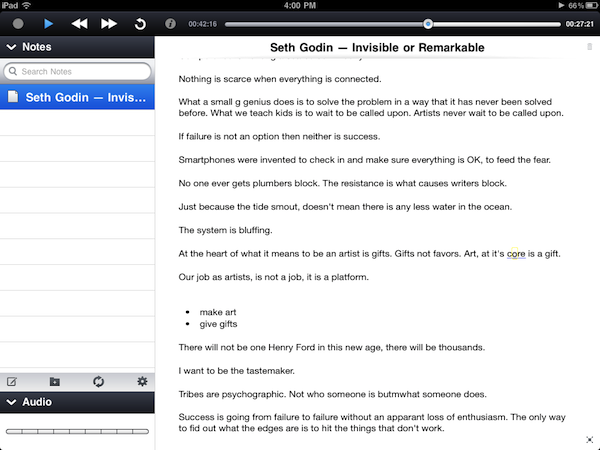 As you can see from the screenshot above, I used it just today to record and take notes of a Seth Godin keynote I have the privilege to attend. Like the desktop version, Pear Note for iPad allows you to record audio while you take notes. When you play them back, your notes will highlight at the time in the recording you typed them. You also can place the cursor anywhere in the notes post recording and it will playback what was recording at the time you typed. This is great for students, conferences, or anywhere capturing the details of a presentation or lecture matter. Plus, it uses Dropbox to sync and share with the desktop version. Easy peesy.